A thermally broken Folding Sliding Door, with open-in and open-out folding options and the capacity to have 8 doors folding and sliding in one direction. Smooth operation and solutions to meet the design brief, the aluminium Comar 7P.i Folding/Sliding Door (FSD) system offers a myriad of possibilities for commercial or residential projects. Comar 7P.i FSD provides a versatile moveable wall that allows space and light into any project. Even in the winter months the glazed facade offers light as well as keeping the building insulated through the trade-marked Comar 7P.i thermal break technology. By merging aesthetically pleasing features such as robust, yet slim, aluminium profiles with feature-laden operational gearing from the Comar 7P.i FSD system, you have the capability to design open-in or open-out stacking doors, folding and sliding from the top or the bottom rollers. Open-in stacking doors are advisable when the doors must operate within the building plane; open-out stacking doors can be used so the doors do not interfere with interior furnishings. If bottom rolling options are required the gear is housed in the floor which offers uninterrupted traffic flow compliant with the very latest disability and equalities act legislation. Top-hung operating gear would be selected for larger sized doors. For additional safety the doors when folding offer a finger protection solution. 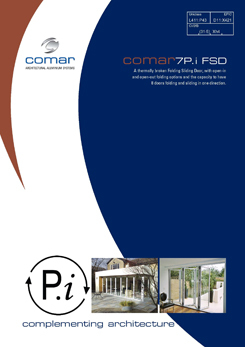 To cater for different apertures the Comar 7P.i FSD offers from 2 to 8 sliding doors in either direction with an optional rebated door for day to day ease of entry. Each leaf can be up to 1100mm wide, creating market leading potential spans with minimum sightlines. Door heights can be up to 2400mm, but depending on wind loading larger sizes can be created, this is especially useful for floor to ceiling glazing or to create an entrance of distinction. Glazing sizes of up to 62mm are catered for, which means that triple glazed or acoustic glasses can be specified as well as panels or standard double glazed units. Due to the trade-marked P.i thermal efficiency U-values are well below the required Building Regulations targets. The doors and jamb are both adjustable to enable long-term smooth operation and to adapt to different building tolerances.